There’s only 3 more days left for Sale-A-Bration which means items that you were able to get FREE from the Sale-A-Bration brochure for every $50 you spend, won’t be available after March 31st. Also, the extra $50 in product of your choice when you join my team will also be gone. Sooo, if you’ve been wanting to join Stampin’ Up! and get a minimum 20% discount on everything you buy, join my team by Sunday March 31st for $99 and select $175 worth of product of your choice and also get a paper pumpkin kit worth $19.95 free as well. Catalogs and other business supplies will also be sent to you should you decide to start a business or just be a hobbyist. Pay $129 and still get $175 worth of product of your choice, plus everything mentioned above and a nifty craft & carry canvas tote bag as shown below. The chose is yours to be either a hobbyist or to start a business. You and only you control what you want to do with it. 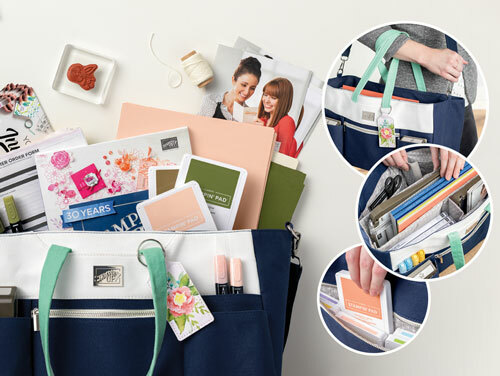 Option 2 : Pay $129 and select $175 worth of product of your choice and also get the craft & carry tote. Even if you decide not to do nothing at all with it, you still get to keep all the product you got when you signed up for a minimum $99 fee. If you decide to join after March 31, 2019, you still only pay $99, but will only be able to select a $125 worth of product. During Sale-A-Bration, you can get an additional $50 worth of product. This offer expires on March 31st at 11:50 pm MT.